Our microfiber fuzzy socks are the softest, coziest socks available and are perfect on a cold winter night. Available in a variety of solid colors or stripes, they're the perfect gift for college students, co-workers, and yourself, of course! The fuzzy socks were so soft and warm. Very comfortable as well. I purchased several pairs of fuzzy socks for my elderly aunt who is in a nursing home. The socks are soft and fit gently on tender feet and ankles. It's a great assortment of colors that wash very well to remain soft and bright. these socks are comfy, cuddly and in a wonderful variety of colors that cannot be found elsewhere. They are cool and cozy ...no sweaty feet! My 16 year old son was just recently diagnosed with Leukemia Cancer. We were sitting in the hospital while he was receiving chemo. He asked me for fuzzy socks. I had no idea what they were but he showed me your web site on line. So I ordered him two pairs one in Merlot and one in Black that he wanted and pink for me. We love them and took a picture and posted it on facebook immediately of just one leg and foot each showing our fuzzy socks. They are warm, stretchy, cozy and pretty. I liked them so much I ordered six more pairs of red as socking stuffers for Christmas. Hey, the family that wears fuzzy socks together sticks together. Thank you Foot Traffic for helping me comfort my son! As advertised, soft, fluffy and well made. Would recommend to anyone who wants a cool stocking! I give all my children and all my grandchildren new jammies to wear on Christmas morning. 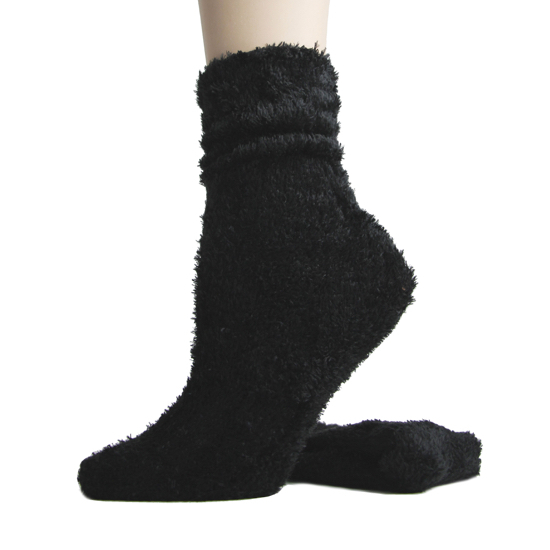 Fuzzy socks for the ladies are a tradition, too, and these are super soft and cozy. Great color choices help coordinate with the jammies this year, a plus in my book. These socks are a bit pricey in comparison, but I trust they wear as well as the other socks purchased from Foot Traffic. This is the third brand of fuzzy microfiber socks I have tried, and these are the best: softer, warmer. Really love them. Wear them like slippers. Best pair of fuzzy warm socks I've had! The softness is just about right. These socks work really well with sandals and slippers as well as those shearling boots. These are the most awesome socks ever they feel sooooooo good on your feet i wear them all the time! It was so easy ordering the new techy finger gloves and the fuzzy socks as gifts for my family members. Fun and useful gifts! These Microfiber fuzzy socks by Foot Traffic are the softest socks I have ever found. If anyone has found socks that are softer than these, please let me know. I have been ordering these socks for several years now. I like to go barefooted at home but I have tile floors and live in Idaho where it's cold 9 months out of the year. So I wear my fuzzy socks around the house. They keep my feet warm and feel good on my feet. I also love that they're easy to get on; I have physical limitations that sometimes make it difficult to put on my socks. So many socks are tight --- these just slip on. Love 'em!! I love these blue and white socks. Get great comments. Now have four pairs in this color and others in black and red.